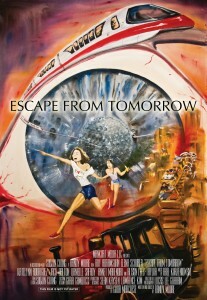 When Escape from Tomorrow—the surreal film Randy Moore guerilla-style in the Disney Parks—was released last year, everyone wanted to know what I thought (I wrote Skeletons in the Swimmin’ Hole: Tales from Haunted Disney World, a collection of ghost stories set in Disney Parks). Now you can find out as I join the gang over at the Dark Discussions Podcast! Please note that all of DD‘s podcasts are also available on ITunes (and Stitcher, too, I think). Enjoy…and if you love horror films, be sure to spend some time listening to the other great shows on their site. The complete archive is here. Want to learn more about the film? Visit the website. You can purchase the DVD from Amazon here (it’s my understanding that it’s also available on Netflix, Itunes, and Amazon’s Video on Demand). Posted on July 23, 2014, in News, Skeletons in the Swimmin' Hole -- Tales from Haunted Disney World and tagged Dark Discussions, Disney Parks, Escape from Tomorrow, horror movie podcasts, movies about Disney Parks. Bookmark the permalink. Leave a comment.